In 2014, I piloted the first autism-friendly session at Manchester Art Gallery as a freelance artist and educator. This project was called Open doors, a monthly sensory-led session that I ran until April 2017. 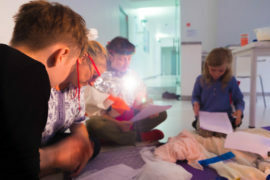 Consequently, I worked closely with the learning curator at Tate Liverpool to implement autism-friendly sessions that continue to run alongside the holiday programme. 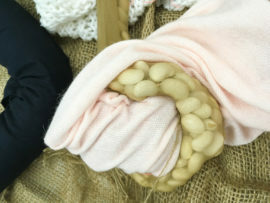 As an artist, I’ve come to realise my broad artistic practice is sensory-led, most obvious outputs for this being the interactive installations and objects I design, and there’s no doubt that my work with Open doors influenced the changes I made in Manchester Art Gallery’s Clore Art Studio, that I co-curated from 2013 – 16. 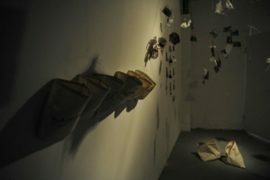 But further back than that, my choice of materials is sensory provocative, I have a need to engage with the viewer through objects, narration and materials. I encourage the viewer to become the participator and this feeds into my work as an educator. 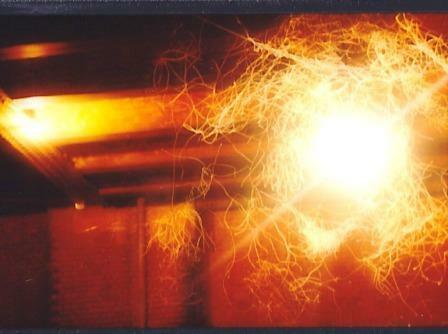 My first exhibition upon leaving university in 2003 was a huge installation of wires that I’d handmade into abstract yet mathematical structures. The wires had been treated in different types of bleach and vinegars to distress and discolour them. The structure was suspended from a 60ft heigh ceiling, in an old train warehouse in Manchester, I lit the sculpture from within by a single, bare bulb. 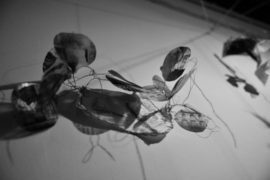 During the day I would stand back and watch with curiosity how people interacted with the wire; the smells omitting from the decaying metal, the fragility of the hair-like web that gently moved in the cool air of the old warehouse. I was transfixed when the viewer became bathed in the shadows of the sculptural space, themselves becoming part of the work. It was called, ‘Listen to the silence‘, I now realise how important this piece was to my future work. A desire to deepen my knowledge and understanding of working with children with Autism was almost accidental, yet I find myself wanting to dig a little deeper and connect a little more. My practice as an artist and educator is highly sensitive and I believe this compliments working with groups to enhance inclusiveness. I came into this ‘autism-friendly realm’ as an artist, with some previous experience of working with children with autism and Aspergers syndrome in schools and galleries, but I’m not an expert. My journey is a constant learning curve, an experimental process and I realised at the beginning of this year that I needed space in this process to stop. And reflect. I was invited by Łaznia CSW, to introduce autism-friendly strategies into the gallery through an artistic collaboration with Learning Manager, Ania Meronk. 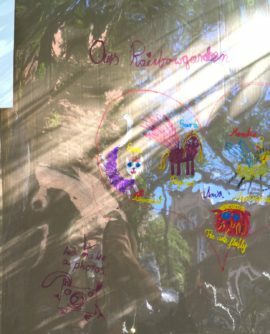 An important element of the project was the engagement of the local community, we wanted to observe first-hand how families with children with autism and other social communication challenges connected with the galleries interior and exterior spaces; what was interesting, important and illuminating to them? 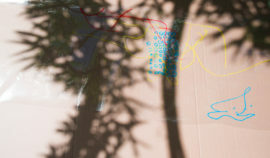 As a group we developed these connections through creative ideas and open-ended engagement, we revealed how the gallery (inside and out), worked as a suitable learning space, and offered feedback on ways the gallery could support further developmental work in the future. Working with children with Autism means that verbal communication isn’t necessarily the way you will communicate, so it was crucial I created an environment that was comfortable, supportive and encouraged meaningful experiences. As a group with a broad spectrum of abilities, it was essential each participant was able to command the space in whatever way best suited them. This led to varying expressions of communication; numbers were written, repeated and turned into patterns, drawn symbols were used to represent inanimate objects, favourite foods were re-imagined using fabrics and stones. 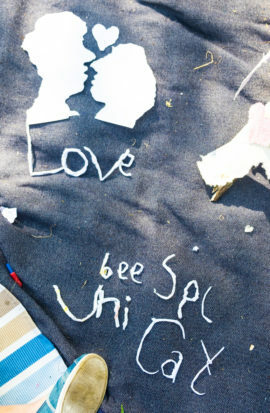 One participant took photographs to document her creations, she also used her experiences in the sessions to inspire an entire play with script. One afternoon we all sat and read through it, as someone who couldn’t read Polish, I listened along with other participants who couldn’t verbalise. Some participants used the handmade objects to express and trigger feelings. Space in the process encouraged new ways of communicating, it led us to develop our own unique language. I visualise the constructed spaces as our world, the materials were our language and we communicated through actions, responses and reactions, in physical, emotive and vocal ways. 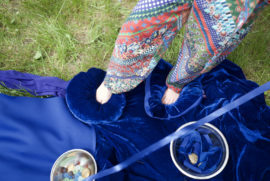 The sensory quality of this new realm, was of over-arching importance, everything was explored with different parts of our bodies, we felt our way through the sessions, and the participants reactions acted as spring boards in the development of the project. As time went by, our understanding of each other deepened and it was touching to see the positive benefits the sessions had on the parents. Not only did some start to join in with activities, but they seemed more relaxed, the sessions gave them a chance to sit and have a coffee, share experiences and stories and observe their child from a new distance. This physical space between the parent and the child would often encourage deeper engagement by the child. The outdoor sessions always seemed more stimulating, the natural sensations of the environment, of the sun, wind and sounds added another textured layer to the sessions. Music became integral, we selected magical, other worldly music, such as, Midori Takada’s, Through The Looking Glass. Music with interesting beats and tempo’s created calmness in the participants, especially piano music, like Philip Glass. We played the music through handheld rubber speakers, so the sounds could be felt close to the body, through the body, with some participants enjoying the reverberating sensations. Space in the process is a chapter to my sensory-inspired research journey, rather than a conclusion. The project has given me space to reflect on the work I’ve developed in UK galleries, and to consider how the ideas and concepts translate in a different country. An extension of this research was the experience of working closely with a group of families who speak a different language to me. The processes we went through as a group have informed the legacy of the project and future implementations that may occur. What these specifically are is unclear at the time of writing, but there is talk of further engagement with the original families and a broader, larger project that culminates in an exhibition of engagement in 2018. 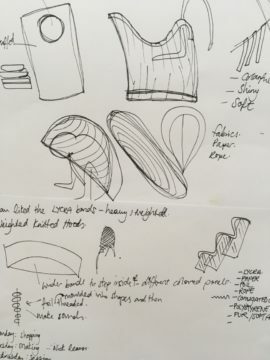 My personal development from this project continues, I’m now making a collection of sensory-inspired objects and I’m interested in how I can adapt my ideas for all ages and abilities. Some of these pieces are wearable and functional, some are developing into larger, sculptural elements, all of this new body of work has a sensory quality to it and I’m eager to see where it takes me next…the journey continues. (And I’m trying to improve my Polish)! A special thanks to Ania, Monika and Ewa for their support and observations. And to the families involved, I hope to see you all again soon! …we cannot ‘know’ the space or make quick assumptions. 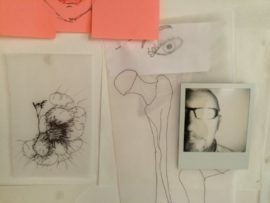 In this way it remains a space that invites curious minds.’ Ian Whadcock, Senior Lecturer on the BA(Hons) Illustration with Animation Manchester School of Art discussing ‘Pattern installation’, Clore Art Studio 2015, Manchester Art Gallery. Designed by myself and Jessica Wild. My understanding of the importance of the right space and the impact a space can have on a persons (child’s) engagement, meant I knew where to focus my attentions first. 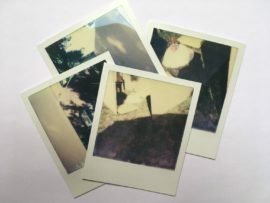 With a week to prepare for the six-week project, I spent time in the grounds of the gallery where ‘Space in the process’ would take place; connecting to the surrounding area and becoming aware of the daily sounds, smells and other textures of life. With so many distracting noises coming from the nearby tram stop, the passing cars and the school next door, I wondered if it would be over-stimulating and possibly stressful for some of the families. 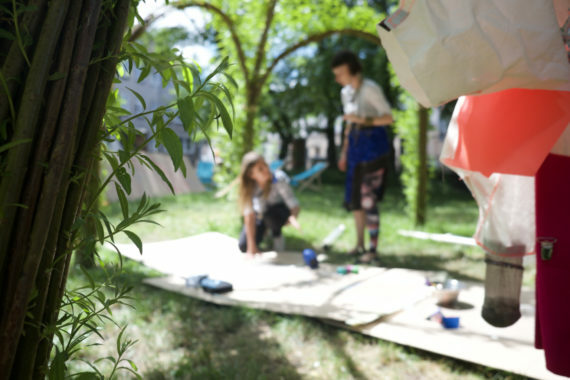 But this wasn’t the case; by creating engaging, sensory interventions and concealed mini spaces within the natural environment, the children and adults felt safe, protected and relaxed, this created deeper levels of engagement and interaction as the project progressed. As with anything process-led, it’s an experiment, and there were moments where the set-up or materials just didn’t work too well, but these times were important for the group to experience so we could develop our understanding of each other and continually build on our new found language, inviting the group to take ownership of the space and future sessions and projects. 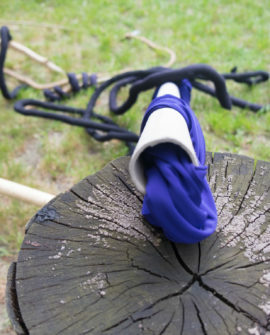 In these environments we explored themes; connections, concealment, colour, construction and play. We engaged with constructed installations, the outside environment and the spaces around our bodies. 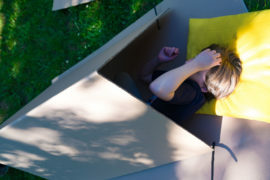 Dens were made from fabrics, cardboard and other materials with interesting textures and sounds, sometimes these ‘dens’ were just pieces of fabric that you rolled your body into. 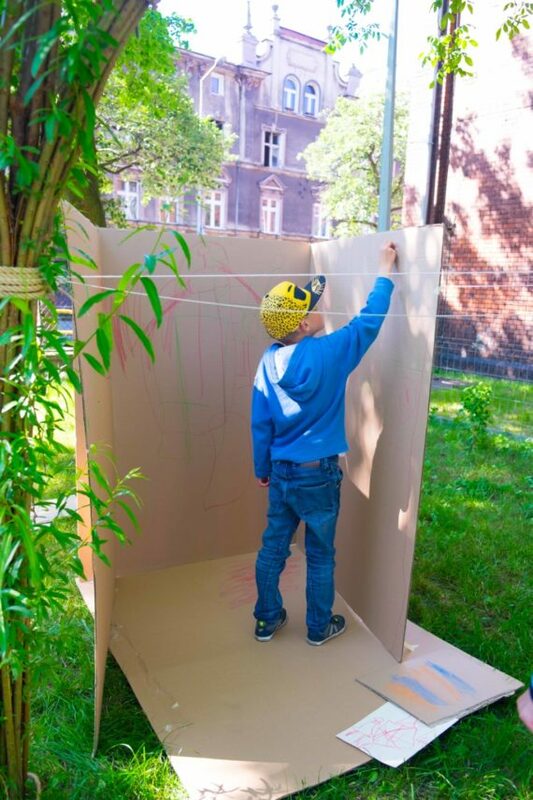 A popular space was a small hut we built from large cardboard sheets. Suitable for one person, this space invited it’s occupier to lie on the soft velvet, lavender filled cushions and listen to the echoing sounds that reverberated off the walls from a handheld speaker which would be held to a stomach or cheek, the vibrations creating space within their own bodies. 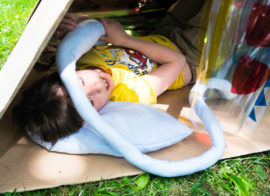 Whilst lying in this cardboard shell, children liked to bang on the walls and listen to the sounds they created, (this reminded me of a young girl who came to Open doors and would sit in a large green plastic tub, holding your arm she would knock it on the sides of the tub, the echoes and vibrations made her so happy!) This small space became a sanctuary for some children. A mother commented on the calming effect it had on her son who was, ‘always running, always watching TV, never just ‘being’. One rainy afternoon, we took the installation inside and shone an overhead projector through clear acetate, (I’ve named this the projection hammock). 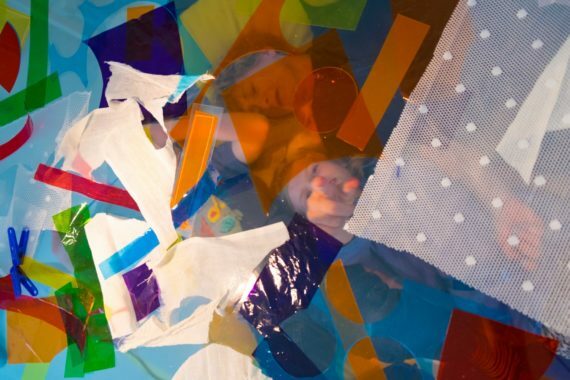 Children lay underneath on fabrics and cushions and looked up; placed on the hammock were colourful acetate shapes and mesh fabrics, the light cast shadows and colours over the mesmerised children. This space could be experienced by a group of children at the same time and they didn’t seem to mind sharing it, something that can be tricky for a child with autism. 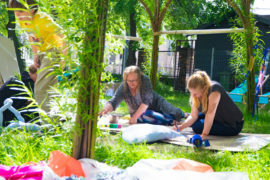 The spaces we created were experiences for the families, they were interactive and sensory and full of ideas that could be taken home and reimagined. On our final day a parent revealed they had tailored their summer holidays to the needs of their sons’ obsession with lifts (elevators). Destined for Stockholm, they’d been researching the most interesting buildings and lifts in the city; they will view the city through the eyes of their child, they will visit the places he feels most safe in and by doing so the family will get to share a unique experience together. I can’t wait to hear how it went! 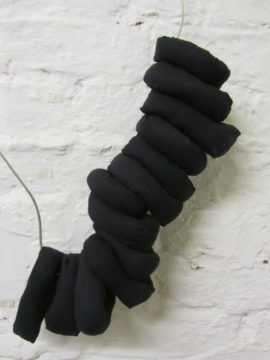 Making objects that you can touch, move, smell or even ‘wear’, has been a growing element of my practice. Space in the process, provided the perfect opportunity to explore the benefits these objects may have on a child with autism, whilst providing time to create! 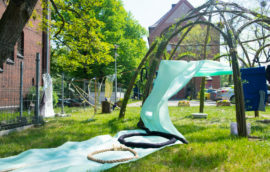 I knew I wanted the project to encompass a fusion of education, design, fashion and play, and I wanted to create handmade objects that would become part of the projects’ pedagogy. I’ve always loved working with textiles, and with help from my assistant on the project, Monika, I found an Aladdin’s cave of colours and textures just a short train ride away in Gdansk. An added bonus were Monika’s passion for design and seamstress skills! Our combined enthusiasm and love for experimental design was the perfect match, we understood what the other meant when describing unconventional ideas and we both developed an acute awareness of the sensory benefits of the objects we made during the project. We developed a range of designs including items that were wearable and helped you view the word in different way. Our aim was to create elements that provided a sense of security and safety for the children, safe spaces for their bodies. 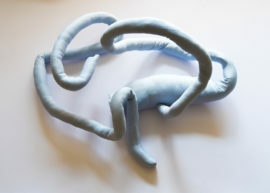 For a number of years I’ve been making sculptural ‘lines’ from fabric, stuffing and wire. 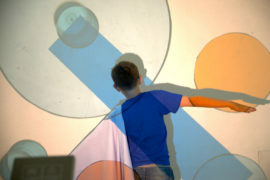 These tactile and malleable structures were initially part of an interactive artwork for Tate Liverpool’s Wolfson Gallery, 2014 as part of the Palle Nielsen exhibition; The Model, which documented how kids ruled the Moderna Museet in Stockholm for three weeks in October 1968 through transcripts, photographs and film. 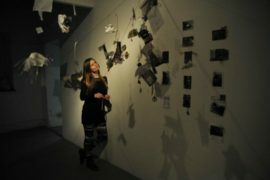 My interactive space was positioned alongside the exhibition as a homage to his ideals. 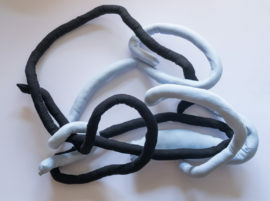 Initially, these lines were used by the participant to twist, connect, loop and coil to create ‘sculptural doodles’, but they became extensions of peoples arms, legs and heads. 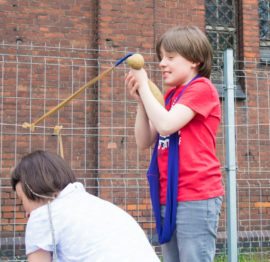 By attaching the linear forms to body parts, the participants became further connected to the work and the activity. 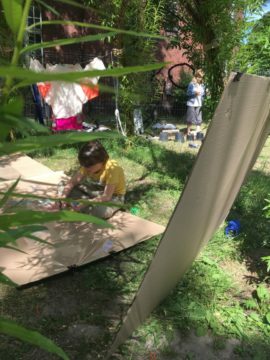 I wondered if the children in the Space in the process project would emulate these developments of engagement and if the children feel positive benefits by engaging with the objects. During Space in the process, I added scents to the sculptures using lavender and various spices. I found lavender was the most welcomed smell, it provided a sense of calmness to the children who enjoyed it, some children with autism have a hyper sensitivity to smells and find them overbearing, that’s why its recommended not to wear perfumes around children with autism. I also incorporated different textures into the sculptural forms using dried beans of different shapes and sizes and sand. Sculptures containing lentils were explored by mouths, one boy in particular loved the sensation of biting into them and surprisingly, my sewing skills meant that the sculptures stayed in tact! 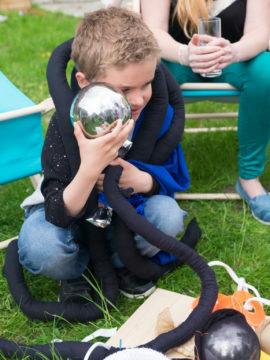 The shape of the lines also changed; they became more limb-like, children loved wrapping them around their stomachs and arms, they were comforted by them, each one like a big ‘hug’. It’s so interesting to observe a child with autism exploring an object with their hands, feet, mouths, stomach or ears. ‘Reading’ an object in such a way must create different sensations for the child. 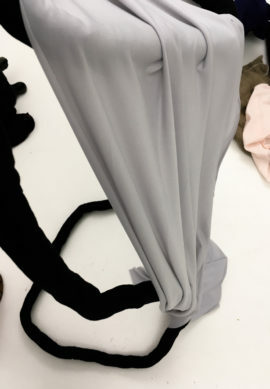 Experimenting with different fabrics was also successful; stretchy lycra, chunky scuba and super silky velvets gave the sculptures a heightened sensory element, I also attached strips of fabric to the ‘lines’, so they could be used to conceal and bind parts of the body. My new project at Łaznia was a step into the unknown on many levels; no prior knowledge of the group, of creating autism-friendly outdoor spaces, and with a minimal amount of speaking or understanding the Polish language! What I was sure and confident about was my practice as an artist educator and my ability to communicate with children and families beyond any spoken language, through the use of creativity. I’m not an autism specialist, but my sensitive approach to my education work and art practice seems to compliment the nature of such needs. What I’ve come to realise of working with children with autism, is that the steps taken may be smaller but they are hugely significant. Time is stretched and magnified. Slight movements can contain so much meaning and, like turning cogs, the effects support the whole family. 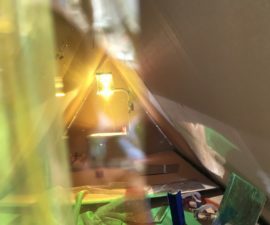 I knew that the space I had created at Manchester Art Gallery supported the Open doors programme, but without that ready-made space, would I be able to create an environment that developed meaningful learning, connections and creative language? 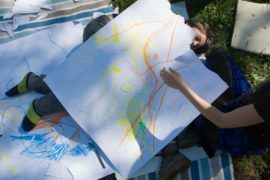 My intention with Space in the process was to slow everything down and explore the true meaningfulness of developing an autism-friendly creative session. My aims with Space in the process, were to observe and research how my autism-friendly work with galleries in the UK would translate overseas. I wanted to connect with new families and to deepen my knowledge by sharing thoughts and ideas with others. I wanted to give my career a shake up, to open myself up to new possibilities and opportunities. On reflection, something that was significantly different from my work in UK, was my personal need to move away from being a gallery educator, and to focus on the project as an artist. #2 I find myself in Poland! Another accidental, life changing event happened at Manchester Art Gallery in 2011. Whilst running a drop-in weekend workshop I noticed a woman quietly observing from the edge. 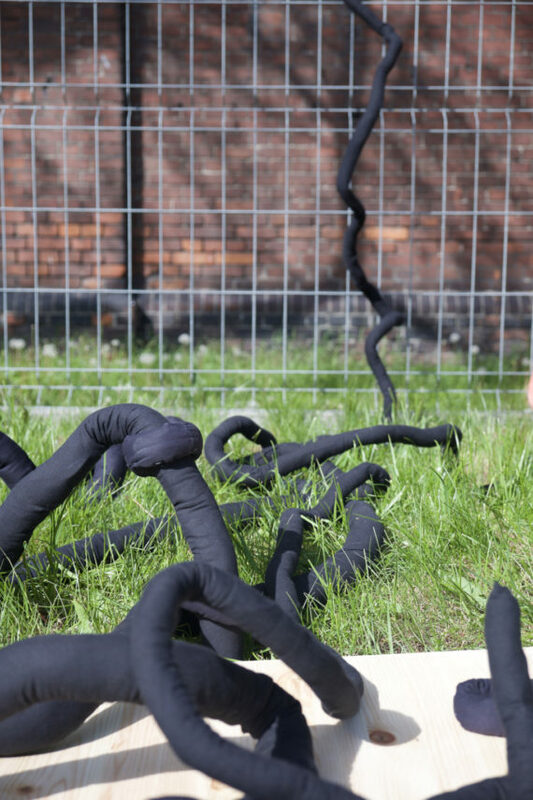 On approaching and inviting her to join in, she introduced herself as the Learning Curator for a gallery in Gdansk, Poland, who was researching new ways of working. We briefly chatted about our approaches to gallery education and, never wanting to miss an opportunity, we exchanged contact details. Fast forward 5 months and I find myself in Gdansk, running workshops at Łaznia CCA funded by the British Council and later in the year having supper with Gilbert and George! (this really is another story). 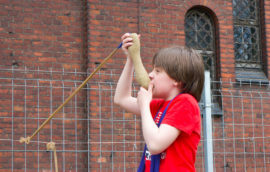 But with these lines of communication open I ensured they never closed and have subsequently been back to develop other experimental workshops with the public of Gdansk and beyond. 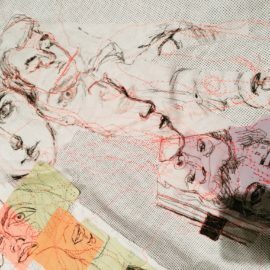 Not only have these opportunities allowed me to share my practice and exchange knowledge with others, they have provided a space for me to reflect on what I find important in art and have developed an awareness of creative communication; how does my practice and ideas translate within a different country, without speaking the language? (more on that later). 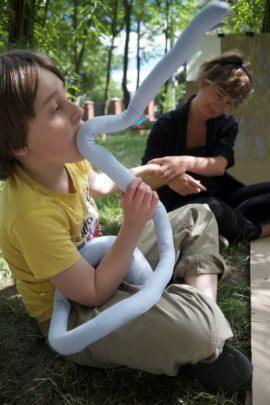 I made contact with Ania Meronk late last year and shared the autism-friendly workshops and research I’d been developing with Manchester Art Gallery and Tate Liverpool. Earlier this year I was invited to present my ideas and practice at the Why and How? 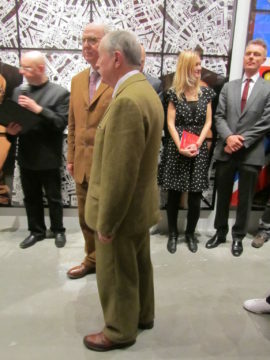 conference at the Royal Academy of Arts, and Ania was able to attend as a participant. 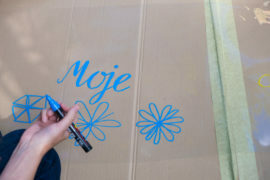 I'm an artist, currently living in Gdansk, Poland and seeking out what my next move is... I work with galleries as an educator and consultant. I like to design and make wearable sculptures. I create spaces for people. I enjoy all things sensory.